Anyone who read my New Hampshire cookie tour article knows that I love cookies. Add to that my adoration for pies. Any kind of pies; traditional fruit pies to seafood to pizza (yes, it’s a pie). I think that National Pie Day (January 23rd) should be declared a holiday like Thanksgiving or New Year’s… no work, stores closed, and we all get to stay home and eat pie. Because that hasn’t happened yet, on the third weekend in January, I head to Rockland Maine for the Pies on Parade Tour. 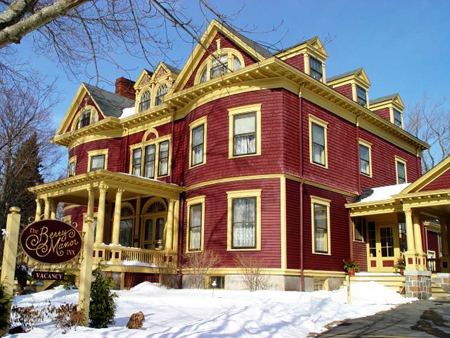 For the past several years the tour has been put on by the four beautiful inns that make up the Historic Inns of Rockland. It’s a weekend totally devoted to pies with each inn baking their signature pies; Limerock Inn offers generous portions of its Key Limerock Pie (don’t even ask for therecipe, it’s a closely guarded secret), the Capt. Lindsey House is famous for their Cornish meat pasties, while the Old Granite Inn makes some of the best seafood quiches I have ever tasted. 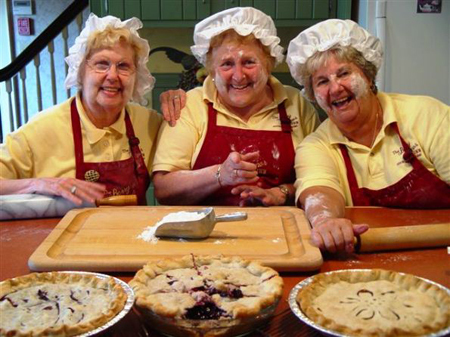 Over at the Berry Manor Inn the “pie moms” (mother, mother-in-law and life-long friend of the innkeepers) will be baking their rich fruit pies. Don’t miss sampling the cranberry apple pie……delicious. These women are constantly at war over which pie crust recipe is better, butter or Crisco so your mission, should you choose to accept it, is to sample both and tell them what your favorite is. In town, restaurants will have 45 different pies on their menus, everything from Shepherd’s Pie to Italian galettes to Whoopie pies. Shops and museums also get into the act. Here are three of my favorite places to visit; the staff at Fiore Oils pass around “healthy” pies that are made from different flavored olive oils (don’t wrinkle your nose, they’re really tasty tarts) the Audubon Project Puffin Center offers what they call “sweet cream puff (in) pastry pies” that are to die for. While touring the Owls Head Transportation Museum you can nosh on pies from different countries paired with stunning antique foreign autos. Rockland is a wonderful town for walking, but being that it will be January in a coastal Maine town count on it being cold so walking may not appeal to you. Leave your car at the Lincoln Street Center for the Arts and hop on the All Aboard Trolley to get to and from the pie venues. All this pie eating is for a great cause. Proceeds from ticket sales will go to the Area Interfaith Outreach Food Pantry that provides fuel and food to mid-coast Maine families in need. Over the years of the Pies on Parade Tour the Historic Inns of Rockland have raised $40,000 for the food pantry. This year they are looking to make the $50,000 donation mark.